Today, Michael O. Varhola, author of Ghosthunting Maryland, reports on his visit to the Piney Point Lighthouse. Located along the banks of the lower Potomac River near its approach to the Chesapeake Bay in St. Mary’s County, Piney Point Lighthouse is a conical stone tower with a detached keeper’s house that became operational in 1836. It has sometimes been called the “Lighthouse of Presidents” because of the several U.S. presidents—including James Monroe, Franklin Pierce, Theodore Roosevelt—who fished and relaxed on or near its grounds during vacations from the White House. 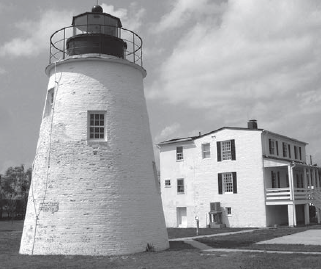 The lighthouse was decommissioned in 1964 and it and the keeper’s house were subsequently incorporated into a little historic complex that includes an adjacent building containing the Potomac River Maritime Exhibit. Over the years, people have reported various sorts of paranormal phenomena at the place, and, while somewhat off the beaten track, it has received some attention from ghosthunters (e.g., the D.C. Hauntings paranormal group conducted an investigation at the site but declined to share their results). Workers at the site have reported numerous strange phenomena, including hearing people speak to them when no one else was present. When I visited the site, I took numerous pictures both inside and outside the lighthouse and walked around the exterior of the tower with my microcassette recorder to see whether I could capture any EVPs. While a subsequent review of my tape did not reveal anything definite, something strange happened while I was recording it: As I walked around the tower, it suddenly struck me that something I couldn’t see was touching and raising up the hair on the back of my hand! About the author: Michael Varhola is a writer who has authored or coauthored 34 books and games—including the swords-and-sorcery novel Swords of Kos: Necropolis and two fantasy writers guides. He has also published more than 120 games and related publications. He is the founder of the game company Skirmisher Publishing LLC, editor in chief of d-Infinity game magazine, and editor of the America’s Haunted Road Trip series of ghosthunting travel guides. He has edited, published, or written for numerous publications, including The New York Times. He also has an active online presence, notably through Facebook and a variety of other blogs, forums, and sites. He lives in the Texas Hill Country.